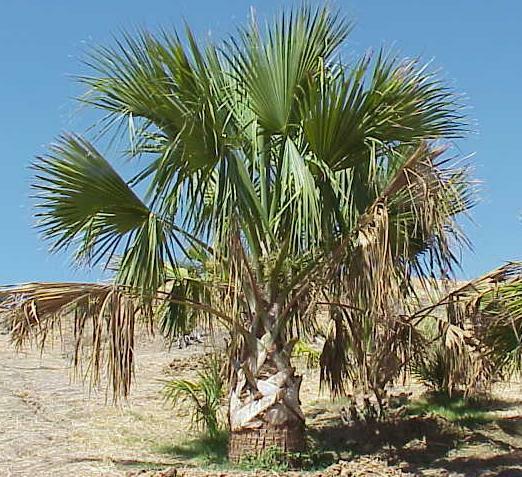 The Sabal causiarum, commonly known as the hat palm, is native to southwestern Puerto Rico; the island of Hispaniola (Dominican Republic and Haiti) and adjacent Caribbean Islands. 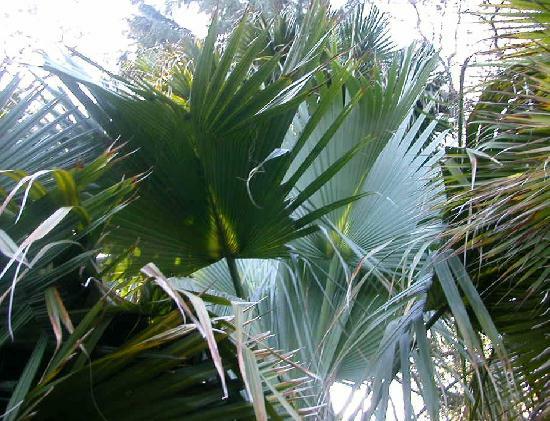 The common name; Puerto Rican Hat Palm comes from its turf of origin and indeed, the young leaves are harvested, dried and woven into hats and baskets. This is a very cold tolerant tree that has been reported to survive the mid teens temperature range with minimal leaf damage. The leaves are deep green with a blue-green tinge and costapalmate. The S. causiarum is one of the most striking of the Sabal species. It is distinguishable from other Sabals by the massive fat trunks. Trunks can grow as big as 4 feet in diameter. Mature trees with smooth trunks look very impressive as a solitary specimen or with a row of them lining a driveway creating living colonnade. 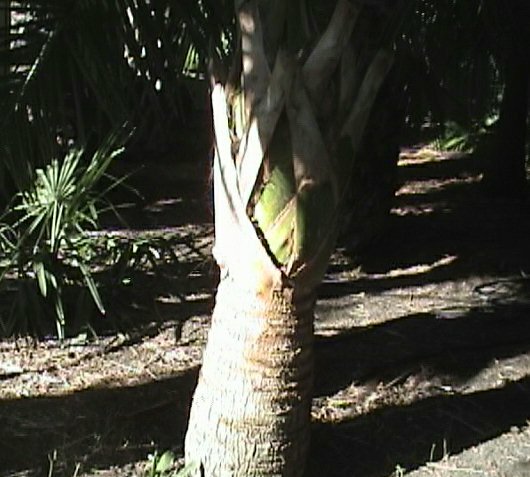 The costapalmate leaves of the S. causiarum are usually 6 feet wide and 6 feet long, are deeply divided and droop at the tips. Costapalmate means that the petiole (leaf stem) extends through the center of the palmate leaf. A lush S. causiarum canopy will contain about 40 mature leaves at a single time. 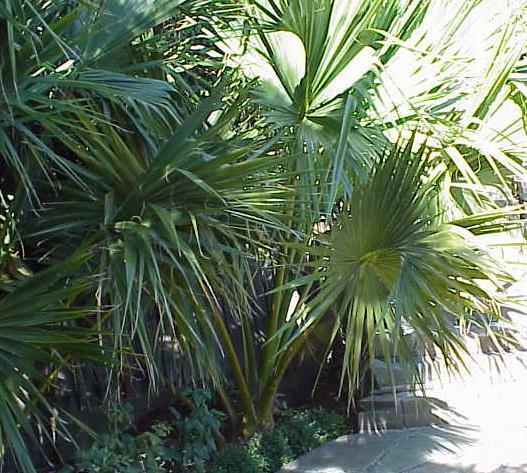 S. causiarum has been the favorite Sabal for folks in Central Florida because of its exceptional characteristics, easy maintenance and availability. Recently this has become the favorite of many throughout the world for its beauty, durability and is indeed of the most striking Sabal species. Very little maintenance is required, since its leaves are self pruning and all that is required is that you pick up the fallen leaves. Other Sabals tend to retain their thatch but the causiarum will shed the leaves and bases as they fade and droop to below 90 degrees to the trunk. This tree produces long flower stalks which hang out from high above the canopy. Flowers are usually white to cream in color, the seed is � inches round and the fruit is usually black or brown. Seeds will germinate in about 2 to 3 months. The soil conditions are not critical as the tree is very adaptable and even drought tolerant making this an excellent choice for xeriscape gardens. The best results will be achieved in full Sun with a well drained soil, regular watering and fertilizing routine. Young specimens are sometimes available locally at specialized Palm Tree Nurseries, but may also require a special order.